I’m at the Home! I mean, I’m home! Which isn’t the same thing. They let me out yesterday, which fills me with joy. After a few jokes about needing a delivery van to take my stuff, and a l iberal sprinkling of Heroes around the staff, Sue appeared, followed shortly (but unrelatedly) by my drugs, and we tootled back to sunny Southbourne. One way in which you (yes you, dear reader!) will benefit is that you will be able to see photos as I can post properly, not just from a mobile phone. Don’t get me started on internet in hospitals. 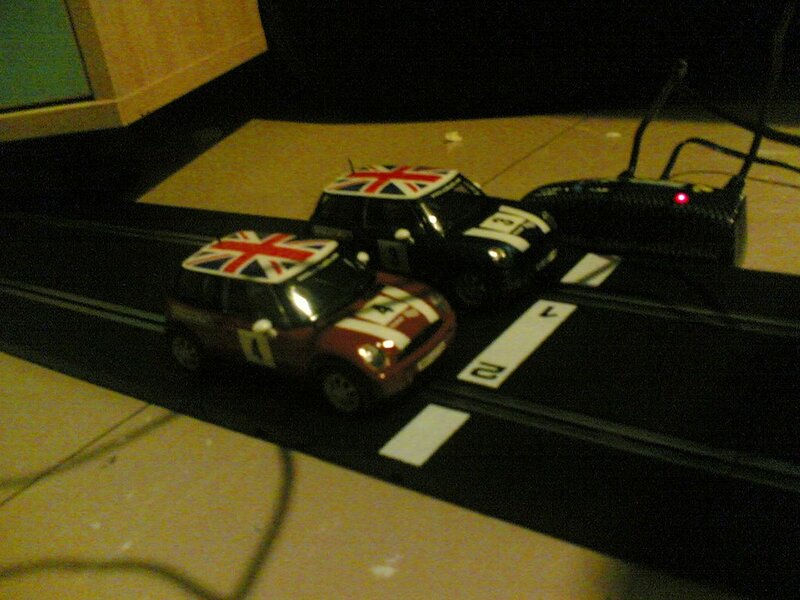 Anyway, here’s a picture of my Scalextric, before I had to take it down. Cool. First, however, I’m going to a barbecue in London E1 tomorrow afternoon, prior to an appointment in the Day Unit at St George’s to check my blood on Monday. I thought that, as I’m feeling healthy at the moment and am not neutropaenic, it would be a great chance to catch up with anybody who is around, particularly before lots of you disappear with the OMV. I haven’t sorted out anywhere to stay, so if anybody can offer a bed on Sunday (tomorrow) night or Monday night, I’d be very grateful. I’ve no idea when the BBQ will wind up, so it might be that I’m able to meet up with people tomorrow evening, but I’ll definitely be hoping to see people on Monday evening. Perhaps I’ll choose a pub, sit in it and hope that somebody turns up. Can anybody suggest a suitable pub? I just don’t know London well enough yet… Anyway, the important thing is that I’d love to make the most of my time fuori ospedale to see people, as I don’t get out much these days. So if you’re free on Monday evening, or Sunday evening, then keep checking here for more details of where I’ll be, or text me. And if anybody wants to put me up for either night, I promise not to snore. Please let me know! And here is a picture of an egg. hi george! happy very belated birthday! you share the 2nd of july with my bro….. just updated myself on your progress via the blog, and am pleased to hear you are feeling good at the moment and am wishing you all the best for the next bits of your treatmet fro here in bolivia…. have been in south america 3 weeks now and it is loco! at the moment it is freezing tho, so i hope you are enjying sunnier climes at home! Wonderfulnews for you George, glad you have finally mde it home, you will be able to set up the scalectrix around different types of mountains now!! Enjoy and the barbie and the pubs. Love Melanie xxxx PS Tis also raining and cold here much further south than Caroline. Enjoy your sunshine George and the walks along Prinsted. Yay George! You have no IDEA how much of a lift your news has given me! Enjoy freedom & all that it brings; looking forward to lots of updates now you can use proper internet! Hope you find somewhere friendly to stay; somehow I don’t think it’ll be a problem! I wouldn’t stay with Harrietti, she smells..
in response to your question – yes, you look exceedingly camp in that photo. which can’t be a bad thing! makes a change from your usual macho, alpha male posturing.